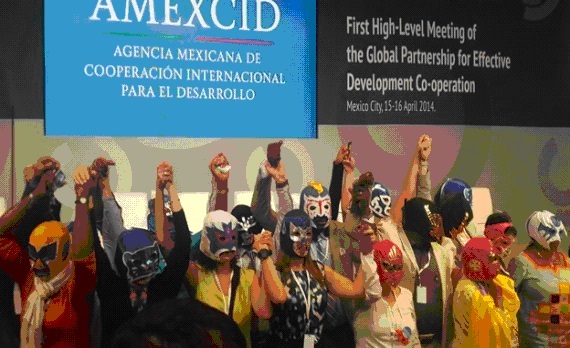 The first High Level Meeting of the Global Partnership for Effective Development Cooperation held in Mexico City on 15-16 April 2014 was a moment to take stock of the progress made since the 4th High Level Forum on Aid Effectiveness. The results were disappointing however. Progress is slow and what is more, states promote an agenda of privatization instead of basing aid on a human rights approach. And it remains important for women’s rights organizations to involve themselves in this process to keep gender in some form on the agenda. The 2011 Busan 4th High Level Forum on Aid Effectiveness was a milestone for civil society (CSO) in that it was the first time that they could take part in this Aid Effectiveness high level meeting. More than 300 CSO representatives were present, a selection of the Civil Society involved in this agenda. Reviewing the ‘Busan Partnership for Effective Development Cooperation’ the worldwide coalition of CSOs demanded that states would strengthen development effectiveness through practices based on human rights standards, aid should focus on the eradication of the causes of poverty and inequality and promote an equitable and just development cooperation architecture. They also called for the recognition of CSOs as independent development actors in their own right, committing states to ensure an enabling environment for their work in all countries. Now, more than 2 year after these commitments were made, the overall assessment is that there is lack of political will to implement the overall agenda and progress is undeniably slow, according to CSOs at the first Global Partnership for Effective Development Cooperation (GPEDC) High-Level Meeting (HLM) held in Mexico City on 15-16 April 2014. The Global Partnership, a result from the HLF in Busan, brings states, business and CSOs together in an alliance. •anchor effective development co-operation in the post-2015 global development agenda. The two-day forum included 5 plenary sessions (Progress in meeting commitments on effective development co-operation; Effective development co-operation in Middle-Income Countries; Tax and Development; ‘South-South’, ‘Triangular’ co-operation and knowledge sharing; and Partnering with Business in Development), and 28 focus sessions on a range of critical themes for development. • ‘Philanthropic foundations’, as they are termed by the partnership, proposed a set of voluntary guidelines on how the philanthropic sector can engage with governments and other stakeholders in the reality of post-2015 development. These initiatives were launched within a voluntary annex to the Communiqué adopted ‘Building Towards an Inclusive Post-2015 Development Agenda’. It is a good-will document rather than a tool to push forward effective and inclusive development co-operation. The WIDE+ network met prior the official HLM with over 150 Civil Society Organizations (CSOs) in order to monitor progress and re-new co-chairs at the CPDE, the coordinating body of CSOs in the Aid Effectiveness process. The CSOs were unanimously critic about the diverse drafts of the Communiqué as well as the optimistic messages sent by governments. • The shrinking civil society space for CSOs as independent development actors. More about this issue is reported in ‘An Enabling Environment For CSOs: A Synthesis of Evidence of Progress Sincce Busan. There is/are backlash and attacks to secure CSOs participation and critical involvement on public policies. By the other hand, WIDE+ and other feminist groups and networks pushed for the inclusion of gender references in the final document. Some countries strongly opposed any mention on Human Rights and gender commitments in the Communiqué as they feared it could be a window for Sexual and Reproductive Rights. The CPDE’s Feminist Group of which WIDE+ is a member, with the support of the CPDE`s co-chairs were fighting until the last minute and finally some references to gender were included on the final document. Also the Feminist Group did some critics and recommendations regarding gender indicator 8 that focused on tracking and allocating public resources for gender equality and women’s empowerment. States recognized some progress related to its implementation, although it remains a critical challenge. States forgot other important commitments made in Busan: i.e. access to gender disaggregated data, gender equality and women’s empowerment in accountability mechanisms, addressing gender equality and women’s empowerment in all aspects of development. This was left out of the final the final Mexico Communiqué. In sum, although the Mexico City communiqué outlines just good-wills unlike in Busan where clear targets were signed off, our concern increases. Not only remain the Busan commitments unfulfilled but this meeting reinforces the basis of a New Deal on development architecture focused on privatization. In this New Deal the states are neglecting their role as the main guarantor of Human Rights and the Right To Development. They avoid accountability on human rights, environmental standards and Gender commitments for South-South collaboration and private cooperation. These key issues remain unresolved in an increasingly disabling context for CSOs with more restrictive policies and scarce funds. Posted on May 2, 2014 July 2, 2017 by wideplusnetworkPosted in Analysis, Feminist Solidarities, Gender and Development, Meetings and WorkshopsTagged Aid Effectiveness, CPDE, Feminism in Action, Financing for Development, Gender and Development, Post-2015 Development Agenda.